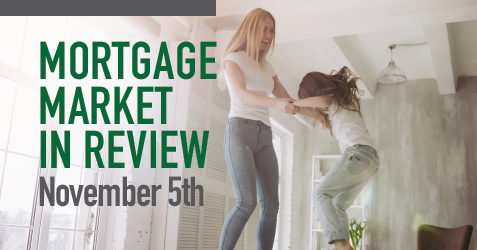 Mortgage bond prices finished the week lower which put upward pressure on rates. The Case Shiller 20 Home Index was 5.5%. Market participants expected an increase of 5.9%. Consumer confidence printed at 137.9, better than the expected 135.8 reading. Stocks saw some large swings again this week but mostly in an upward direction. The ADP payrolls report showed the economy added 227,000 jobs last month. Traders expected the addition of 180,000 jobs. The Employment Cost Index in Q3/2018 rose 0.8%, higher than expectations for an increase of 0.7%. Productivity in Q3/2018 rose 2.2% which was slightly above the forecast of a 2.1% increase. Unemployment was 3.7% as expected. Payrolls rose 250K versus the expected 190K increase. Mortgage interest rates finished the week worse by 1/4 of a discount point. 1:15 pm, et None Important. Notes will be auctioned. Strong demand may lead to lower mortgage rates. 1:15 pm, et None Important. Bonds will be auctioned. Strong demand may lead to lower mortgage rates. 8:30 am, et 215K Important. An indication of employment. Higher claims may result in lower rates. 2:15 pm, et No rate changes Important. Few expect the Fed to change rates, but some volatility may surround the adjournment of this meeting. Core up 0.2% Important. An indication of inflationary pressures at the producer level. Weaker figures may lead to lower rates. In the US the consumer is often seen as the driving force of the economy. A large percentage of the total economic output is for personal use. Analysts attempt to predict the future spending patterns of consumers to gauge economic activity. The Michigan consumer sentiment index is one piece of data used to measure consumer attitudes. The index is derived from a telephone survey, which gathers information on consumer expectations of the overall economy. The preliminary report is released around the 10th of each month and then is revised throughout the remainder of the month. It is significant in that it provides a precursor into consumers’ willingness to spend in the months ahead. However, many analysts point out that willingness to spend does not always convert to actual expenditures. As the economy continues to improve, housing prices escalate, and energy prices remain historically tame, American consumers continue to spend. However, any jolts ahead of the holiday season could cause concern. Look for any variation from estimates in the consumer data this week to cause mortgage interest rate volatility. Signs of eroding consumer confidence could lead to improvements in mortgage interest rates. However, stronger than expected figures could spike rates higher.